On March,28 A.Lukashenko s ignedthe bill "About Standard of the P resident of Re public of Be larus ". Standard will be the copy of Belarus State flag, adopted at May 1995 referendum but with some new details. On the small flag-pole there will be reeved a silver cramp with engraved family name, name and father's name of president. In the center of the flag will be the golden image of state coat of arms. The flag will be fringed of golden colour. The standard will be in service cabinet of head of the nation. The copy of it will be erected over president residence in Minsk, over other residences where president will stay at this moment, will be placed at all presidents means of transportation. With the arms of Belarus that Zeljko sent, I was able to composite a flag Isaw on Ukrainian television by a local outlet here, of the Belarus presidential flag, which I saw on his car on the tv footage. In reference to the Belarus President's flag: The FRC says the proportions should be 10:12 and that the arms should be only slightly overlapping the green stripe. On the Belarus' president standart is coat of arms only in gold (not color), so the star de facto has a gold border. The president standart (prop. 5:6) was hoisted 3.7.1997 on 9.00 a.m. 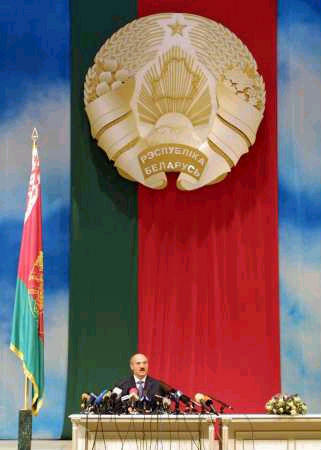 Yesterday, I saw President Lukashenko's speech in front of a huge Belarus flag in the Parliament. This flag, probably the most official of all Belarus flags, is slightly different from the usual pictures. The red pattern in the white field is edged by two narrow white vertical stripes; in other words, the national ornament does not reach hoist and fly margins of the white field. When being in the capital of Minsk (Miensk) some days ago I noticed a special version of the official flag hoisted above President Lukashenka's residence in Karl-Marx-Street. It displayed in addition to the design of the Republic's flag in its centre the golden outlined emblem of the Republic. I suppose it to be the presidential flag (unfortunately a grim looking militia-man kept me from taking a picture there). In a photo found s on Yahoo News and can be also found at Lukashenko's official website, one can see the current Belarussian President, Alexander Lukashenko. The flag is like the national flag, including the ornament, with the same colors. The flag is in a ratio of 5:6, defaced with the Belarus CoA on it. The CoA is drawn in gold, but I do not know if the flowers are drawn in their natural colors. I have only the reconstruction (!) of Belorussian presidential flag at my site <www.vik-lomancov.narod.ru>. I have no foto (and I never had it...). 5:6 - official ratio of the presidential flag . Photo of this flag is at <www.president.gov.by>. Notice how the arms is presented. It is a golden outline of the arms, and the parts that are not golden, they are red.